What makes the perfect cannabis growing environment? What does it take to get the healthiest growth and best yields from your indoor cannabis plants? Consider a grow tent if you want a pre-made perfect growing environment for your marijuana plants! When growing cannabis, you want to give light that is bright but not too bright. The amount of light you provide is one of the major factors that will determine your yields, and with smaller grow lights your yields will be limited no matter what you do. Light also changes how your plant grows. For example, the color spectrum of light can cause your plants to grow tall and lanky or more bushy and squat. Some grow lights like LED grow lights take advantage of a custom color spectrum to help your plants grow as optimally as possible. However, it’s also possible to give your cannabis plants too much light, especially with big grow lights, so it’s important to keep grow lights the right distance away. The long and the short of it is: If it’s comfortable for you, it’s comfortable for your plants. 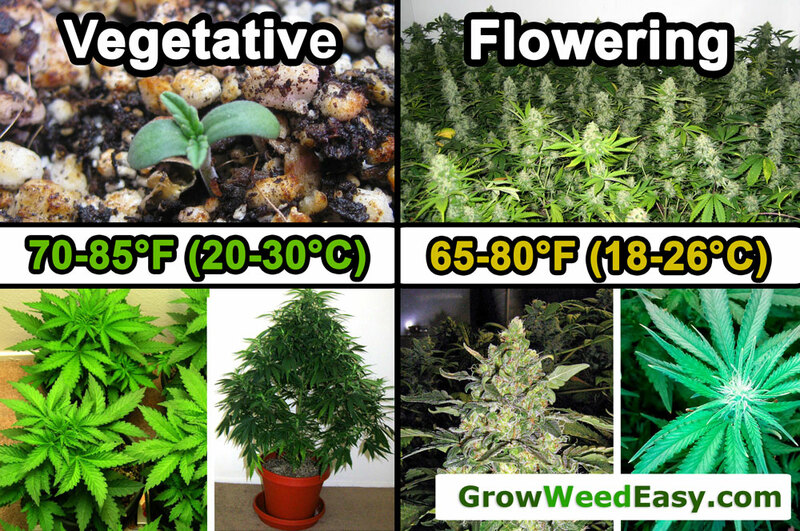 Cannabis plants like temperatures in the 70-85°F (20-30°C) range and can start to run into problems when the plants are experiencing temperatures outside that range. Making sure your plants always have a gentle breeze and plenty of fresh air will not only get your plants to grow faster, but getting this right also prevents problems with mold and common cannabis pests like fungus gnats and spider mites. Basically, you want a nice, gentle breeze moving over and under your plants if possible. If all the leaves are being gently rustled it’s perfect. You don’t want to point a fan directly at your plants, but you also don’t want any leaves sitting in stagnant or hot air. A small oscillating fan or two in the grow space can work wonders. In addition to making sure there’s air moving around in the grow space, it’s also important to vent out heat from your grow lights, especially if it’s getting too hot in your grow space while they’re on. While many growers know ventilation is crucial to those using HPS lights, it’s important to note that ventilation is just as crucial for LEDs, LECs and even CFLs and t5s. 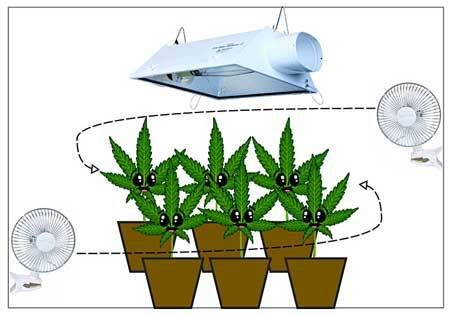 As they get higher in wattage, LEDs and CFLs can and will produce heat that needs to be vented out of the grow area. 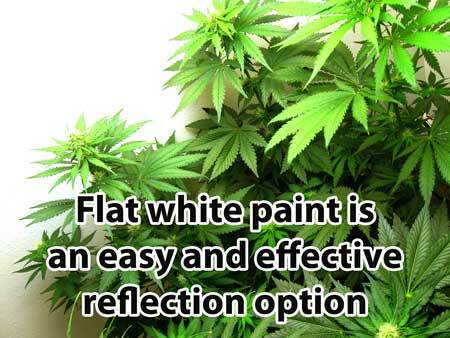 You will get the most from your indoor grow lights by reflecting light at your plants. Instead of letting the walls of the grow space absorb extra light from your grow light, you can use a reflective material to bounce it back towards your plants. This allows you to squeeze more yields out of the same grow light without having to change anything else about your environment. 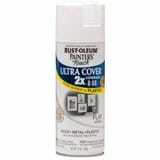 Flat white latex paint is a surprisingly cheap and easy wall material that has 85-95% light reflectivity. Yes, it’s true, simply painting your walls can actually increase your yields! There are also many other materials with great reflectivity, and some of the professional options work better than paint. Unless it’s very high or low, humidity usually won’t cause any major problems with your cannabis grow. However, there are a few tricks with humidity to get faster growth and more resin production on your buds. It’s important to realize that there is no one “perfect” growing environment. Just like people, each plant is a little bit different and may respond better to some environments than others. For example, some plants can better handle the heat or cold, and some plants aren’t as picky about good air circulation. But by taking care of the 5 factors of a great cannabis growing environment, you will ensure that your plant will be comfortable no matter what the strain! And of course, if you run into any problems, diagnose your sick cannabis plant right away!